Virtualization has become one of the biggest game- changers in the enterprise landscape, as more companies rely on its benefits across every level of business. Citrix, a leader in the virtualization space has been instrumental in providing enterprises with the mobility, security and performance they need, while reducing the IT costs. With server, application and desktop virtualization solutions, Citrix allows enterprises to easily access data and perform operations from anywhere in the world. Coupled with its network consulting services and cloud computing technologies, Citrix has become the go to solution for enterprises looking for virtualization. Today, there are numerous products and services available around the Citrix ecosystem. This makes it extremely challenging for the CIOs, while looking for service providers to help them with consulting, implementation, and support. To assist CIOs in navigating the Citrix landscape, CIO Review is presenting its annual special edition on the leading players in the space. 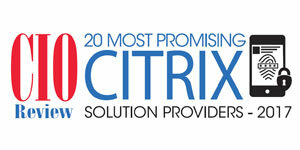 A distinguished panel comprising of CEOs, CIOs, VCs, and analysts including CIO Review’s editorial board has chosen the “20 Most Promising Citrix Solution Providers 2017” in the U.S., listing the best vendors and consultants who provide value added solutions in the Citrix landscape. The listing provides insights into the way these solutions are put to use, so that you can gain a comprehensive understanding of what technologies are available, which are right for you, and how they will help you overcome competition. We present to you CIOReview’s 20 Most Promising Citrix Solution Providers 2017.